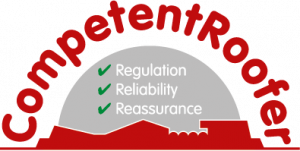 Many new roofs require Building Regs, this can add cost and delay to your work but the Government has introduced a self-certification scheme and we are fully trained and qualified to issue Building Regs on our work. We are are self-certified through the Government backed Competent Roofer Scheme, our Registered Account No. is 18-1028. Find out more at the Competent Roofer Website. • If 50% or more of your roof needs to be replaced, then under the Building Regulations, you must upgrade your installation to the current minimum standard and your Local Authority needs to be notified a minimum of 48 hours before work commences. Failure to comply could result in an enforcement notice from your Local Authority. • Without Building Regs you may face difficulties when you decide to sell your property. • A claim on your home insurance may be invalidated if work on your roof was not correctly covered by Building Regs. • We are self certified so we can complete this work for you and you do not need to involve the Local Authority.